Stay in the kitchen when you’re cooking. Unattended cooking is the leading cause of cooking fires. Wear short or close-fitting sleeves when you cook. Loose-fitting clothing can catch fire. Keep an eye on children in the kitchen. When they’re old enough to cook, teach them how to do it safely. Keep your cooking areas clean. Food and grease build-up can increase the risk of fire. Keep curtains, towels, pot holders and other fabrics away from hot surfaces. Store solvents and flammable cleaners away from heat sources. Never keep gasoline in the house. Turn pan handles inward to prevent food spills that can result in serious burns. Immediately call your local fire department. Have the department’s emergency number on hand, as calling 911 will instead direct you to a central emergency services center. That means the response time could be slightly longer. If a grease fire breaks out, put a lid on the pot to smother the flames, then turn off the heat and leave the lid in place while the pan cools. Use baking soda to extinguish cooking fires. If a fire starts inside the oven or broiler, keep the door closed and turn off the heat to smother the fire. Keep a fire extinguisher in the kitchen and know how to use it. Contact your local fire department for training. Keep a working smoke detector in your home and test it every month. 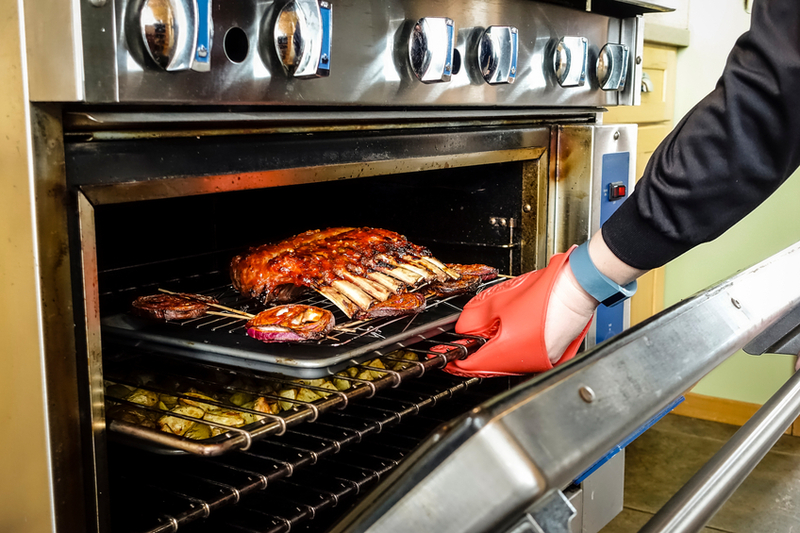 AHAM and appliance manufacturers are attacking the problem of unattended cooking fires through the technical advances to cut down on the potential for fires, and through consumer awareness initiatives like the Recipe for Safer Cooking. Visit AHAM’s store to order copies of the Recipe for Safer Cooking and other fire-prevention information.